February 28th, 2018 — TRAXXALL Technologies, providers of a highly innovative aircraft maintenance tracking and inventory management system, today announced a partnership with Airbus Helicopters, the world’s leading helicopter manufacturer. All new Airbus Helicopters delivered in the US and Canada will include the TRAXXALL aircraft maintenance tracking and inventory management system for one year. Additionally, TRAXXALL and Airbus Helicopters will offer a special promotion for in-service helicopters. The partnership will also provide customers with an end-to-end digital experience for their operations. 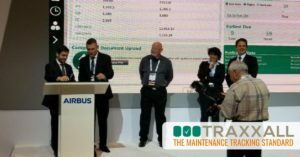 They will benefit from a seamless data exchange between Fleet Keeper, Airbus Helicopters’ electronic technical logbook, and TRAXXALL’s maintenance tracking system. Note to Editors: TRAXXALL is exhibiting at HAI Heli-Expo, Feb. 27 – Mar. 1, Las Vegas Convention Center, booth 4917. To schedule an interview, please contact Mark Lowe, PRagmatic Communications: mark.lowe@pragcom.com / (514) 499-9632 / (514) 576-2519.